In a time when escapism is desperately needed, Trick Dog is taking it to the next level, taking it to 30,000 feet to be exact! 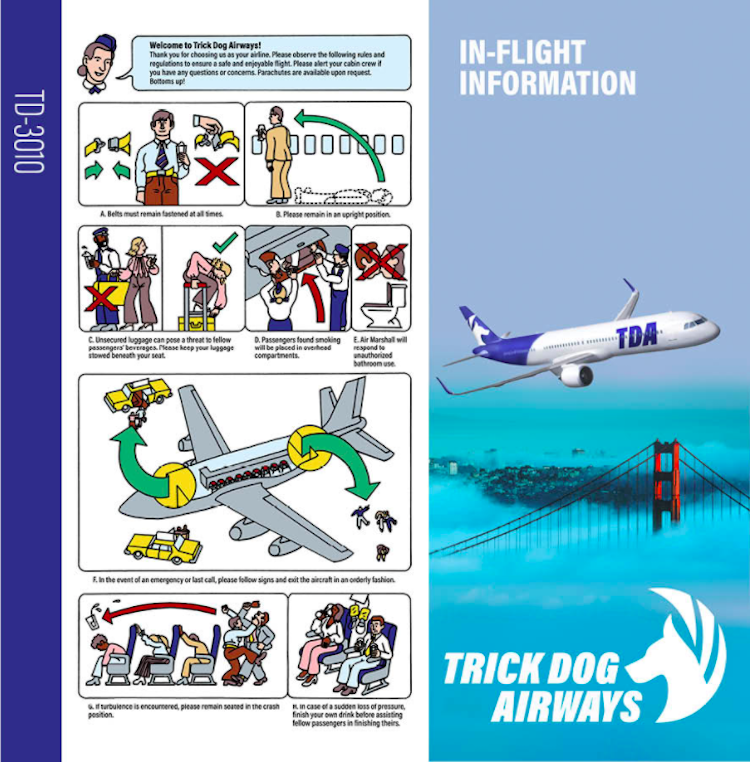 Well known for their extreamly creative menu designs and concepts, the launch of their 11th menu on January 8th revealed Trick Dog Airways. And it’s everything you wish you were drinking when crammed into economy with a screaming baby behind you! 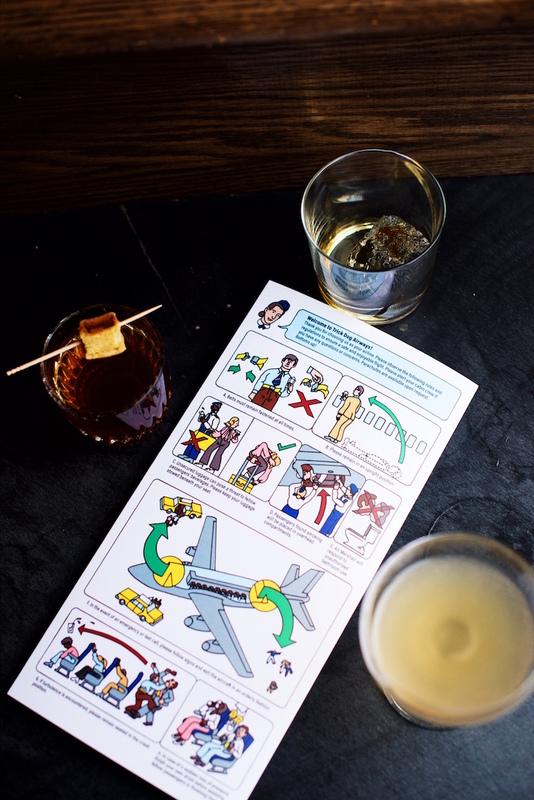 After walking into the industrial yet cozy bar, it appears the bartender hands you an inflight safety brochure, but like their drinks, not everything is what they appear. Perusing the card illustrated by Peter Gamlen, it reveals to be in fact be the cocktail menu. 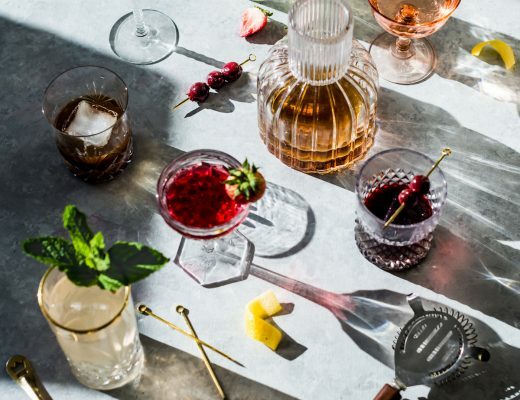 On one section is “types of aircraft” divided into Highballs (including one with vodka and La Croix), Shoots (like an all in one pickle back), and Low Proof beverages (oloroso sherry, Singani 63, vanilla, sarsaparilla, cardamaro, lemon). 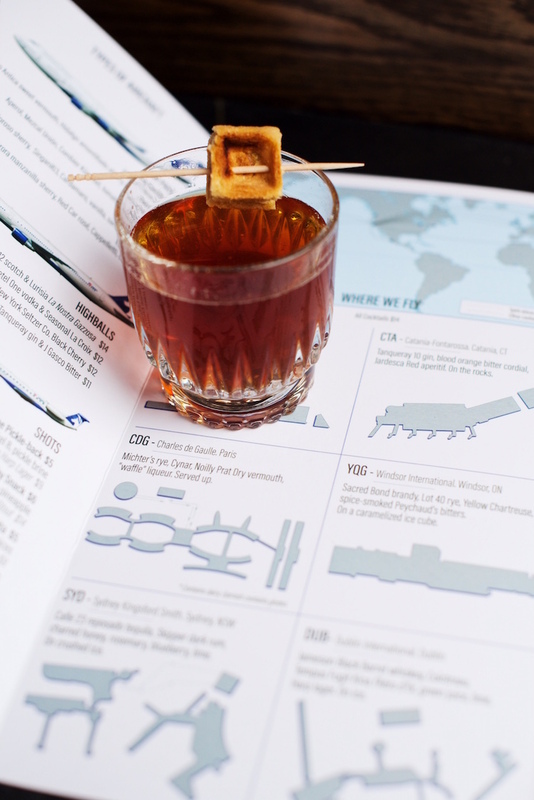 Diagrams of international airport layouts from around the world dot the interior of the menu. 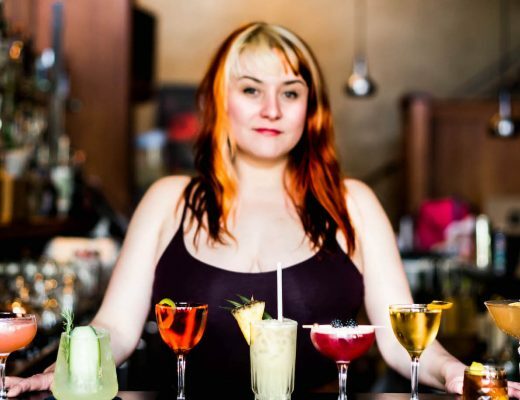 Below each airline are the ingredients for each of their featured cocktail that range from baked apple, seaweed, Anco Reyes, falernum bitters, and even a caramelized ice cube. Special spirits are listed in their business class such as a dram of hand selected Elijah Craig Bourbon distilled in 2007. My fellow passengers aboard Trick Dog Airways included photographers and cocktail shakers Emilio from Equal Parts Cocktail and Andrew Calisterio. Which means I got to try a good amount of the cocktails on the menu! My favorite was the CDG Paris. It had a freakin waffle on it. I like when my cocktails are garnished with a snack. It contained Michter’s Rye/ Cynar/dry vermouth/waffle liqueur served up with a waffle piece kissing the rim. Although waffle might make you think sweet, it didn’t come off as saccharine in anyway. 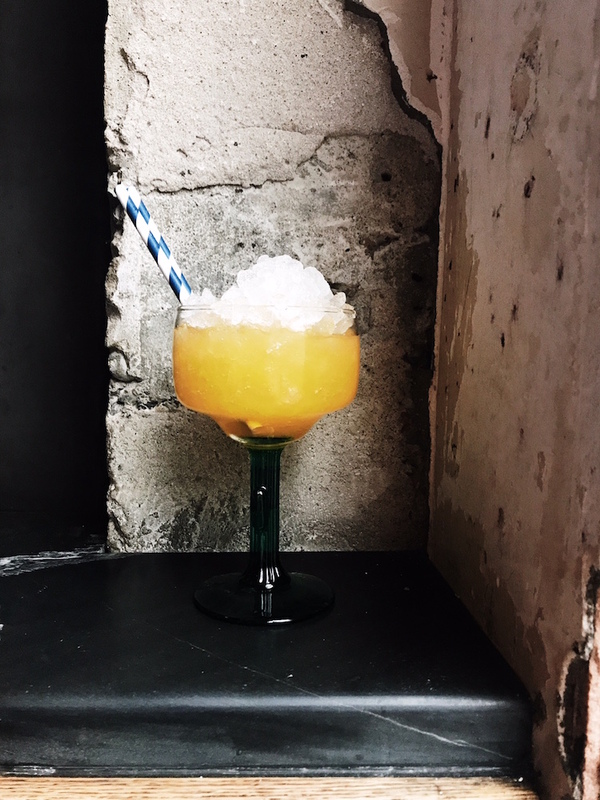 Impeccably balanced cocktails are the name of the game at Trick Dog. Other cocktails I found particularly interesting were the BOS Boston- Jack Daniels rye/Smith & Cross Rum/Bonal Quina/cherry/darjeeling/lemon/egg white/on the rocks and the YQG Windsor- Sacred Bond Brandy, Lot 40 rye/Yellow Chartreuse/spice-smoked Peychaud’s/caramelized ice cube. And did I mention their is pins and a frequent flyer card? 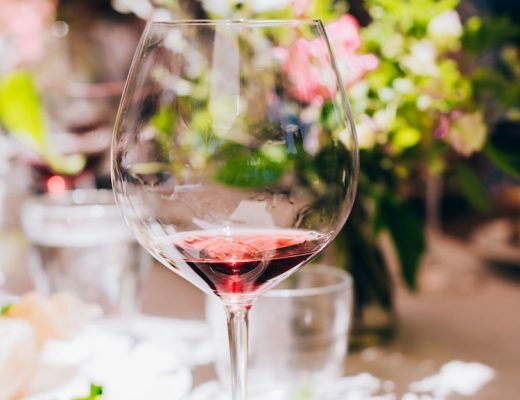 Depending on the menu, the TD team will produce paraphernalia to enhance the menu theme as well as the drinker’s experience. 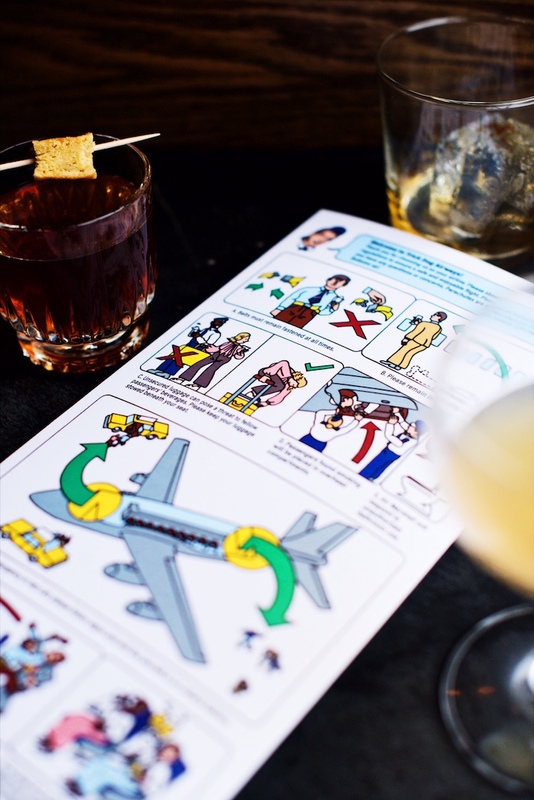 In this case, captains pins are given out to adorn on their lapels and shirts, coasters with the airline logo, cocktail napkins depict airplanes alongside iconic landmarks from city’s around the world, and a frequent flyer card is passed out for thirsty guests to keep track of tipples eventually earning them rewards. I will be racking up my miles in no time! Along with their menu launch, TD often puts out a video to accompany it. Funny, slightly cheesy, and always cleaver, the video further immerses imbibers into the creative world partners Morgan Schick and Josh Harris paint for their guests. For their Trick Dog Airlines, an “inflight video” was produced and it’s far more entertaining than annoyingly catchy Virgin Airlines safety video (RIP). “Passengers found smoking will be placed in the overhead compartment.” Noted! TDA from Trick Dog Bar on Vimeo. Trick Dog offers their menus for sale to take away as a souvenir of your drinking adventures (so don’t be a jerk and steal them.) They work with a different charity or cause with each new menu and donate proceeds from the menu sales to them. For Trick Dog Airways, sales will benefit Seven Tepees Youth Program whose mission is to work with urban youth entrusted to their care to foster the skills they need to make lifelong positive choices and to create their own opportunities for success. It’s great to see bars and restaurants working closely to support every facet of the communities in which they are in. 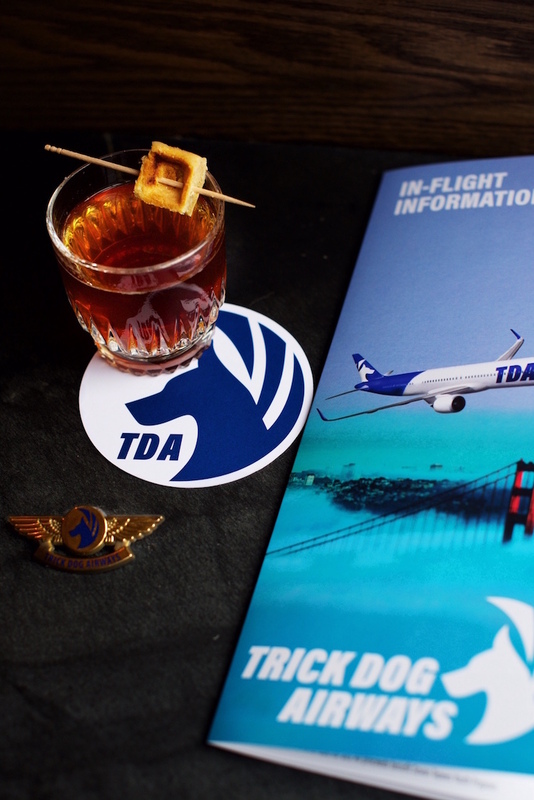 The menu runs through the beginning of July when a new menu will be revealed, so be sure to book your tickets now on Trick Dog Airways!